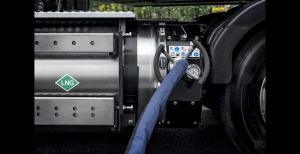 “With our new trucks running on liquefied natural gas or biogas, we can offer an alternative with low climate impact that also meets high demands on performance, fuel efficiency and operating range. This is a combination that our customers in regional and long haulage require,” says Lars Mårtensson, Director Environment and Innovation at Volvo Trucks. Instead of an Otto cycle engine, which is the conventional solution for gas-powered vehicles, the Volvo FH LNG and Volvo FM LNG are powered by gas engines utilising Diesel cycle technology. This means that an operator who chooses gas can do so without compromising on driveability, fuel efficiency or reliability. Volvo’s 460 hp gas engine delivers maximum torque of 2300 Nm while the 420 hp version produces 2100 Nm. This is the same as Volvo’s corresponding diesel engines. What is more, fuel consumption is on a par with Volvo’s diesel engines, but 15 to 25 per cent lower than for conventional gas engines. In order to maximise the driving range, the tanks are filled with LNG, which is stored at 4-10 bar pressure at a temperature of -140 to -125 °C. The biggest fuel tank variant contains enough LNG for a range of up to 1000 km. Refuelling takes about the same time as filling up with diesel. When driving, the fuel is warmed up, pressurised and converted into a gas before it is injected into the engine. In order to ignite the gas, a tiny quantity of diesel is added at the moment of injection. 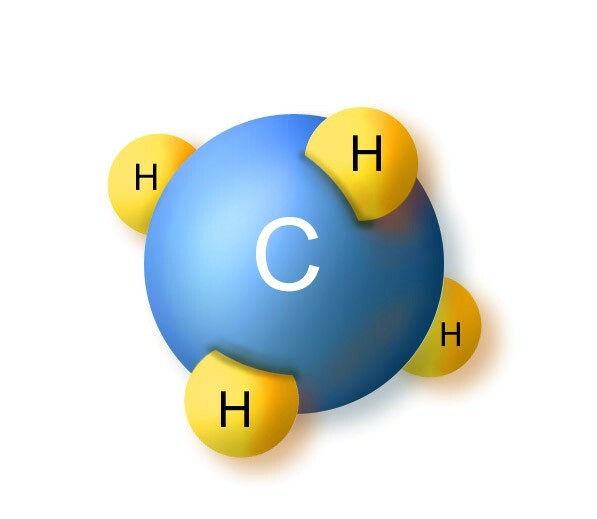 A 100 per cent reduction of CO2 emissions requires that fossil diesel is replaced with HVO (Hydrogenated Vegetable Oils) and combined with bio-LNG. 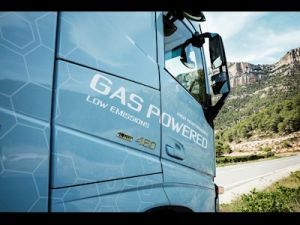 Volvo Trucks is now working together with gas suppliers and customers to develop the expansion of LNG infrastructure in Europe. This development is also being supported politically in many countries and by the EU. A strategy for expanding LNG infrastructure is also included in the European Commission and member states’ action packages for securing Europe’s long-term energy supply. “Natural gas offers clear climate upsides, it is competitively priced in many countries, and there are sufficient reserves to justify large-scale use. Our focus on LNG vehicles is creating new prerequisites for our customers to run fuel- and cost-efficient operations. At the same time, we’re making it possible for heavy truck operations to considerably reduce their climate impact,” says Lars Mårtensson. Available versions: Tractors (4×2, 6×2, 6×4) and rigids (4×2, 6×2, 6×4) with gross vehicle weights of up to 64 tonnes for regional and long-haul operations. Engine: Volvo G13C Euro 6. In-line 6-cylinder 13-litre common rail engine, injectors nozzles for gas and diesel. Available with 420 hp/2100 Nm and 460 hp/2300 Nm. Fuel tanks: Available with 115 kg (275 l), 155 kg (375 l) or 205 kg (495 l) LNG for up to 1000 km operating range. A small diesel tank is also fitted. Exhaust after-treatment: SCR and particulate filter. The Volvo FH LNG and Volvo FM LNG are Whole-Vehicle Type-approved and certified as per European standard ECE R110.